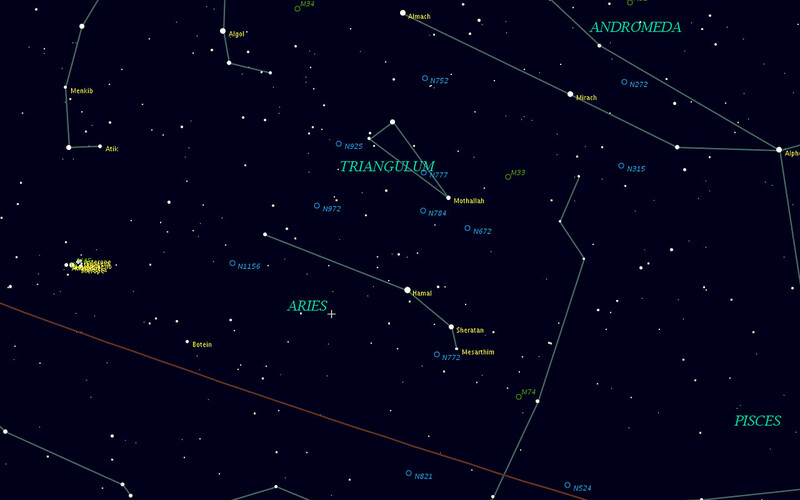 Aries has surprisingly few objects of interest, but it's an important constellation for jumping off into other regions. A prerequisite here would be Taurus. Alpha Arietis is called Hamal, "Sheep". The constellation is quite insignificant now, compared to its original function, of signalling the arrival of the Spring Equinox. Some two or three millennia ago the Sun's arrival in Aries marked the return of the Spring. Thus it was that Hipparchus chose to begin mapping the heavens using Aries as the starting point, at 00h. This "zero hour" has since moved over to Pisces. Today the most interesting thing about Aries is the group of stars formed by its brightest members. Hamal, to the east, is a yellow giant while Sheratan (beta Arietis) is blue-white and gamma Arietis is an interesting binary, also formed of blue-white stars. Finding the three is an easy naked-eye exercise. From the Pleiades move to the west until, at the same declination, you come to the three stars. The three stars are convenient for finding a number of other stars, such as alpha Piscium, which is 15� directly south of the Aries group. Investigate Pisces in the fall. By midnight, however, in early January both Aries and Pisces have already set. Around 7 p.m. in early January a much smaller constellation can also be conveniently visited after locating Hamal. Triangulum is just to the north of Aries and has a binocular Messier object, M33. But visit Triangulum soon because by February it too will have disappeared until next fall.